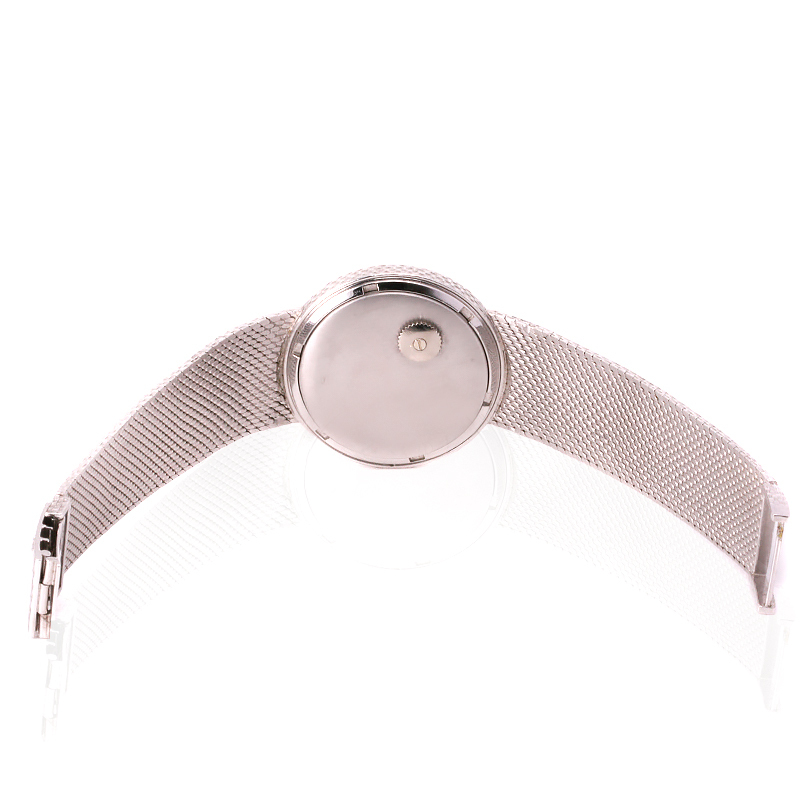 Product code: W1227cc Categories: Patek Philippe, Watches. The Patek Philippe Calatrava is one of the most iconic models by this prestigious watch company, and here is a very rare 18ct white gold back wind Patek Philippe Calatrava reference 3563.2. Dating from the mid-1960’s this Patek Philippe is made in solid 18ct white gold and is fitted with the Patek Philippe integrated band which measures a full 18cm from end to end and wraps so elegantly around the wrist. However making this particular vintage Patek Philippe even more special are two unique features. Firstly there is the fabulous hammer finish dial which looks incredible day or night and is so elegant with the sleep index markers. And secondly the case itself measures 34.5mm across and has no crown on the side. Rather the crown is on the reverse side to set the time making this such a wonderful and unique feature rarely found on any Patek Philippe. Inside is the wonderful automatic Patek Philippe calibre 350 that has just been serviced and comes with our twelve month warranty. 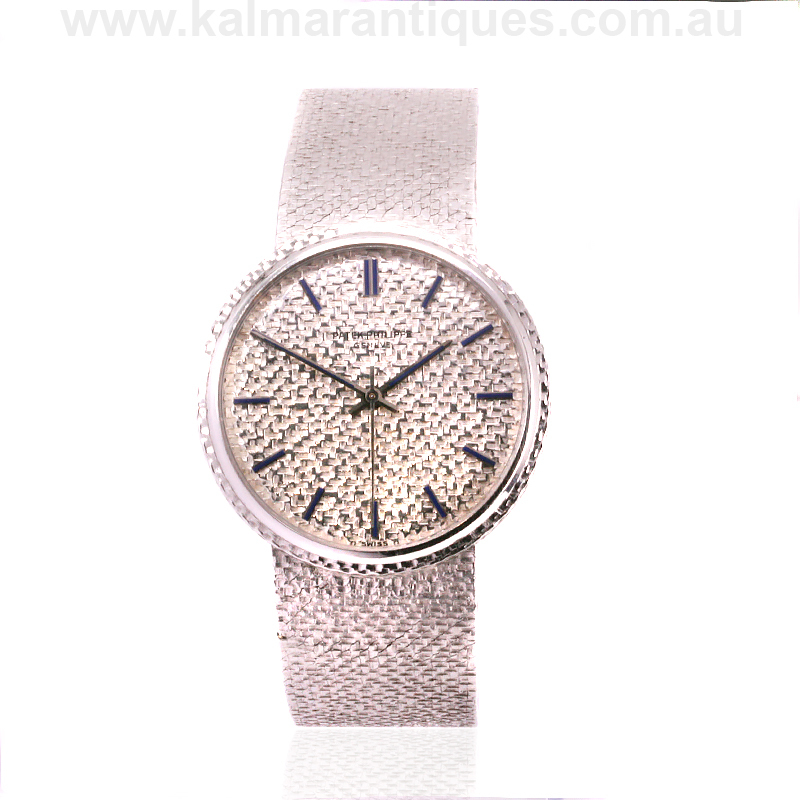 Perfect for any suit and occasion, this vintage Patek Philippe Calatrava is as stylish as it is hard to come by. Tags: Patek Philippe, Patek Philippe reference 3563.2.